Which natural disasters hit most frequently? In the last 20 years, flooding has been the most common natural disaster by far, accounting for 43% of all recorded events. In a joint report with the UN Office for Disaster Risk Reduction, the Centre for Research on the Epidemiology of Disasters recorded 3,062 natural flood disasters between 1995 and 2015. 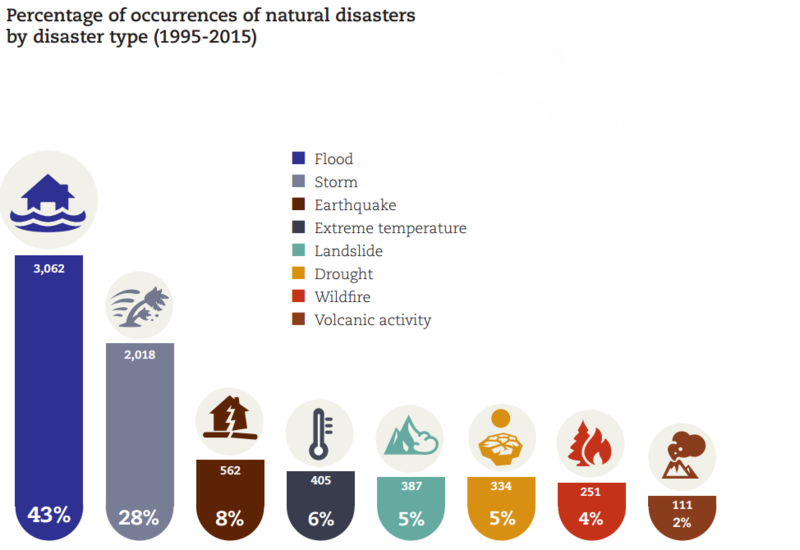 The following infographic from the report highlights the most frequently occurring natural disasters between 1995 and 2015. The second most frequently occurring disaster was storms, at 28%, while earthquakes was third. The infographic highlights the high frequency of storms and floods – with the top two responsible for over 70% of the world’s natural disasters. The report also emphasises the increase in weather-related natural disasters across the period. Between 2005 and 2014, there were an average of 335 such natural disasters per year. This is an increase of 14% on the previous 10 years, and nearly double the level recorded from 1985 to 1994. Although the precise impact of climate change cannot be calculated, the report suggests that an increase in extreme weather in the future will result in continued increases in weather-related disasters. However, the report also argues that better flood control is within reach for agencies working to reduce the risk of disasters. The availability of affordable and effective technologies, such as dams, mobile dykes and early warning systems, could reduce the impact of flooding around the world.